A Freshwater Futures community group has been established for the Pongakawa/Waitahanui catchments, to inform the development of changes to the Regional Natural Resources Plan. Through a series of workshops held over two years, the group is helping to identify community values and aspirations for freshwater, and providing advice on freshwater management options. The group's area of interest includes the freshwater bodies and land catchments of Little Waihī, Paengaroa, Pukehina, Ohinepanea, Ōtamarākau and Pongakawa. Their work will result in a draft plan change that sets objectives, limits and methods (including rules) for improving the way water quality and quantity is managed locally. The process for implementing the National Policy Statement for Freshwater Management and what values should be provided for. The current state of water quality, quantity and ecology in the catchment's rivers, groundwater, wetlands and Waihī Estuary. Logical geographic areas for establishing water management objectives (Freshwater Management Units). What an acceptable state of in-river values such as ecosystem health, swimmability and mahinga kai (food gathering) might look like in local waterways, and how that could be measured. Pongakawa WMA Freshwater futures community group on a field trip. Discussion during a Pongakawa Freshwater Futures field trip. 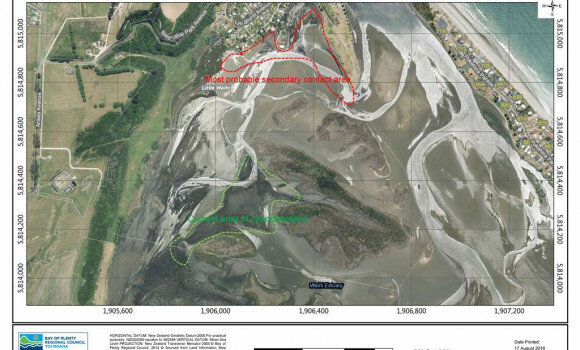 “The health warning means that people should avoid any activity which involves contact with the water in Waihī Estuary at Pukehina,” says Dr Neil de Wet, Medical Officer of Health. “Shellfish accumulate the toxin and so it’s advised that shellfish are not collected from anywhere in Waihī Estuary or the estuary mouth,” says Dr de Wet. Dogs are particularly at risk and should be kept away from the shoreline or areas where algal mats may accumulate.